This article is about the national personification of India. For the Hindi film, see Mother India. 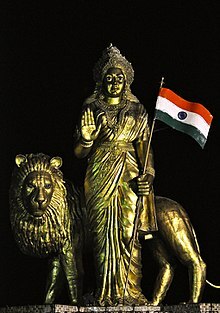 Bharat Matā (Hindi, from Sanskrit Bhāratāmbā भारताम्बा; अम्बा ambā means ‘mother’) is the national personification of India as a mother goddess. She is an amalgam of all the goddesses of Indian culture and more significantly of goddess Durga. She is usually depicted as a woman clad in a saffron sari holding the Indian national flag, and sometimes accompanied by a lion. The image of Bhāratmātā formed with the Indian independence movement of the late 19th century. A play by Kiran Chandra Bannerjee, Bhārat Mātā, was first performed in 1873. The play set in 1770 Bengal famine depicted a woman and her husband who went to forest and encounters rebels. The priest takes them to temple where they were shown Bharat Mata. Thus they are inspired and led rebellion which result in defeat of the British. The Manushi magazine story traces origin to a satirical work Unabimsa Purana or The Nineteenth Puranaby Bhudeb Mukhopadhyay which was first published anonymously in 1866. Bankim Chandra Chattopadhyay in 1882 wrote a novel Anandamath and introduced the hymn “Vande Mātaram“, which soon became the song of the emerging freedom movement in India. As the British Raj created cartographic shape of India through the Geological Survey of India, the Indian nationalist developed it into an icon of nationalism. In 1920s, it became In the 1920s, it became more political image sometimes including images of Mahatma Gandhiand Bhagat Singh. The Tiranga flag was also started being included during this period. In 1930s, the image entered in religious practice. The Bharat Mata temple was built in Benaras in 1936 by Shiv Prashad Gupt and was inaugurated by Mahatma Gandhi. This temple does not have any statuary but only a marble relief of the map of India. Bipin Chandra Pal elaborated its meaning in idealizing and idealist terms, along with Hindu philosophical traditions and devotional practices. It represented an archaic spiritual essence, a transcendental idea of Universe as well as expressing Universal Hinduism and nationhood. Abanindranath Tagore portrayed Bhārat Mātā as a four-armed Hindu goddess wearing saffron-colored robes, holding the manuscripts, sheaves of rice, a mala, and a white cloth. The image of Bharatmata was an icon to create nationalist feeling in Indians during the freedom struggle. Sister Nivedita, an admirer of the painting, opined that the picture was refined and imaginative, with Bharatmata standing on green earth and blue sky behind her; feet with four lotuses, four arms meaning divine power; white halo and sincere eyes; and gifts Shiksha-Diksha-Anna-Bastra of the motherland to her children. Indian Independence activist Subramania Bharati saw Bharat Mata as the land of Ganga. He identified Bharat Mata as Parashakti. He also says that he has got the Darśana of Bharat Mata during his visit with his guru Sister Nivedita. In the book Everyday Nationalism: Women of the Hindu Right in India, Kalyani Devaki Menon argues that “the vision of India as Bharat Mata has profound implications for the politics of Hindu nationalism” and that the depiction of India as a Hindu goddess implies that it is not just the patriotic but also the religious duty of all Hindus to participate in the nationalist struggle to defend the nation. This association with Hinduism has caused controversy with India’s religious minorities, especially its Muslim population. The motto Bharat Mata ki Jai’ (“Victory for Mother India”) is used by the Indian Army. The temple is located in the Mahatma Gandhi Kashi Vidyapeeth campus in Varanasi. The temple houses a marble idol of Bharat Mata along with a marble relief map of India. The temple was founded by Swami Satyamitranand Giri on the banks of the Ganges in Haridwar. It has 8 storeys and is 180 feet tall. It was inaugurated by Indira Gandhi in 1983. Floors are dedicated to mythological legends, religious deities, freedom fighters and leaders. The temple is located in Michael Nagar on Jessore Road, barely 2 km away from the Kolkata Airport. Here, Bharat Mata (the Mother Land) is portrayed through the image of ‘Jagattarini Durga’. This was inaugurated on October 19, 2015 (Mahashashti Day of Durga Puja that year) by Shri Keshari Nath Tripathi, the Governor of West Bengal. The initiative to build the temple, which has been named ‘Jatiya Shaktipeeth’, was taken by the Spiritual Society of India in order to mark the 140th Anniversary of ‘Vande Mataram’, the hymn to the Mother Land. Jump up^ “History lesson: How ‘Bharat Mata’ became the code word for a theocratic Hindu state”. Jump up^ “Far from being eternal, Bharat Mata is only a little more than 100 years old”. ^ Jump up to:a b Roche, Elizabeth (17 March 2016). “The origins of Bharat Mata”. livemint.com/. Retrieved 22 March 2017. Jump up^ “A Mother’s worship: Why some Muslims find it difficult to say ‘Bharat Mata ki jai'”. Jump up^ Kinsley, David. Hindu Goddesses: Vision of the Divine Feminine in the Hindu Religious Traditions. Motilal Banarsidass, New Delhi, India. ISBN 81-208-0379-5. pp. 181-182. Jump up^ “Archived copy”. Archived from the original on 2016-03-10. Retrieved 2016-03-09. Jump up^ Kalyani Devaki Menon, Everyday Nationalism: Women of the Hindu Right in India: The Ethnography of Political Violence, University of Pennsylvania Press, 2009, ISBN 978-0-8122-4196-9, p. 89f. Jump up^ “Patriotism in India: Oh mother: A nationalist slogan sends sectarian sparks”. The Economist. 9 April 2016. Retrieved 9 April2016. Jump up^ Vinay Kumar (2 October 2012). “It is Jai Hind for Army personnel”. The Hindu. Chennai, India. Retrieved 8 October 2012. Patriotic fervour The Hindu, August 17, 2003. The life and times of Bharat Mata Sadan Jha, Manushi, Issue 142. Friends plz like shear this video and subscribe my channel plz…. .
Stay up to date on results for bharat mata.